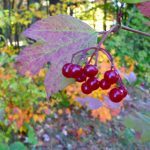 The highbush cranberry is actually not a cranberry at all, though its fruit, or ‘drupes’ as they are known taxonomically, strongly resemble cranberries in both appearance and taste. They also mature in the fall, as cranberries do. The two plants are quite different, however. Both are native to North America, but the highbush cranberry is a Viburnum, a member of the Caprifoliaceae, or Honeysuckle family, in contrast to the ‘true,’ or lowbush cranberry, which is a Vaccinium, a member of the Ericaceae—Heather or Heath—family. The Honeysuckle family is comprised of about 400 species, with 11 tree species—and numerous shrub species—that are native to North America. They are located mostly in north temperate regions and in tropical mountains. 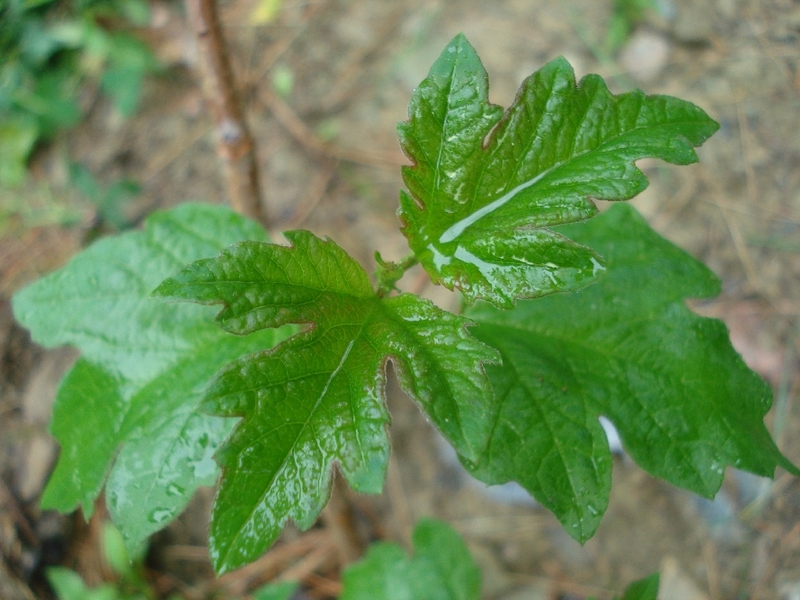 In North America, the highbush cranberry stretches from British Columbia east to Newfoundland, south to Washington state and east to northern Virginia, with an isolated population in New Mexico. 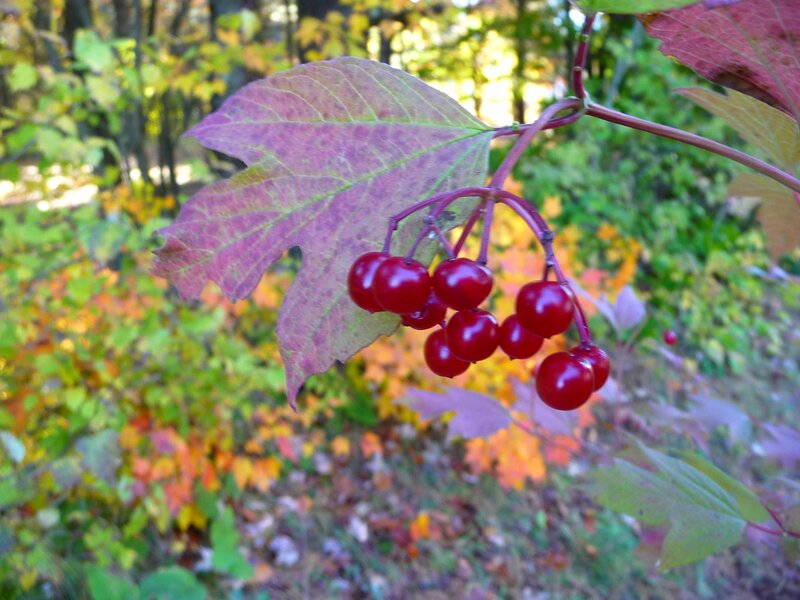 According to the Natural Resources Conservation Service, the highbush cranberry is listed as ‘endangered’ in Indiana, ‘threatened’ in Ohio, and ‘rare’ in Pennsylvania. Grows in hardiness Zones 2 through 7. 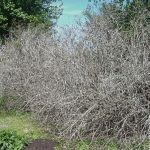 Considered a large and hardy deciduous shrub with a moderate growth rate of up to 3 ft. per year, the plant is typically 8 to 15 feet tall by 8 to 10 feet wide, with arching stems and a very dense, rounded form, making it a popular landscaping choice for use as a screening hedge [For a solid screen, plants should be spaced 2 to 3 ft. apart.]. It is noted for attracting wildlife, especially birds which benefit from the fruit, which can remain on the branches well into mid winter. It is tolerant of frost, likes sun or semi-shade, and is successful in most soil types but does best in well-drained, moist soil that is rich and loamy. Established plants can tolerate drought, but they are helped by supplemental watering during such periods. 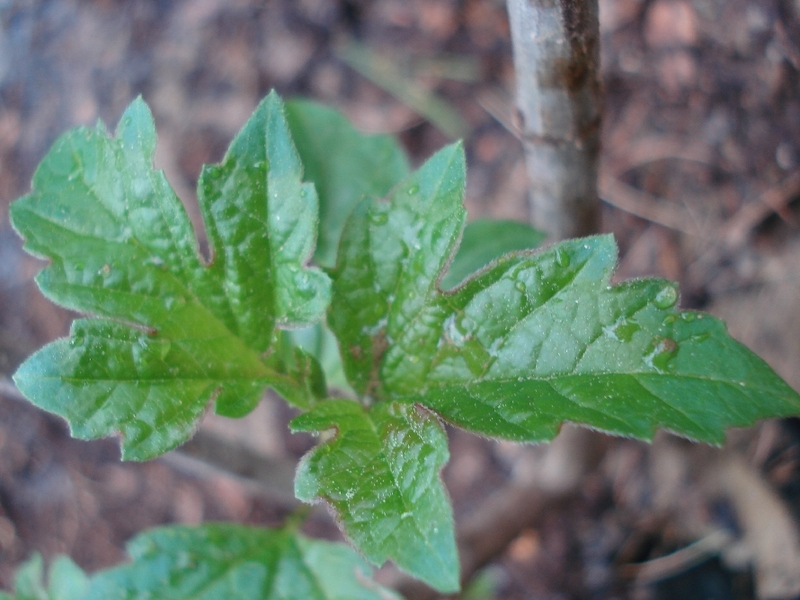 Leaves: Opposite, simple, 3-lobed and 2 to 4 inches long. They are superficially similar to many maple leaves, but have a somewhat wrinkled surface and impressed venation. They are glossy dark green in the summer but often change to yellow-red or red-purple in the fall. 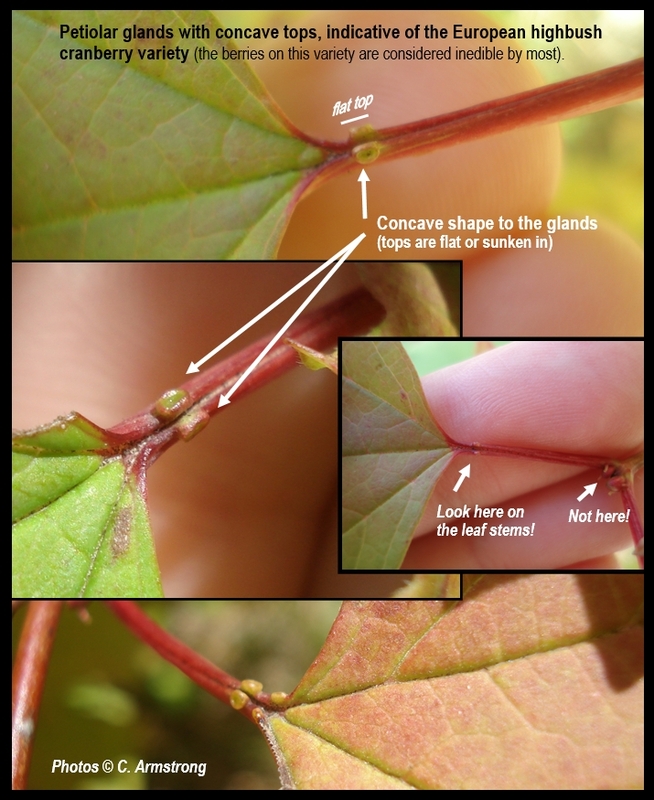 The petiole is grooved and has round, raised glands near the base. Flowers: It produces flat-top clusters of showy white flowers in June. The clusters are 2 to 3 inches across, with an outer ring of larger, sterile flowers. The flowers are hermaphrodite (having both male and female organs) and are therefore self-fertile, meaning that an individual plant’s flowers can pollinate one another, so there is no need for a second type (or even a second individual plant) to provide pollen and produce fruit. The flowers are pollinated by both wind and insects. Fruit: Nearly round drupe (drupe: a fleshy fruit with a central stonelike core containing one or more seeds) about 1/3 inch diameter with a single large seed, bright red, juicy and quite acid, like a cranberry. The seeds ripen from August to September. It does not begin to produce fruit until approximately five years of age. Edible Qualities: The fruits/drupes can be eaten raw (though not very tasty that way) or cooked, and like cranberries, they are rich in vitamin C and so have a tart, acid taste (the taste is best after a frost and when picked slightly under-ripe). They are an excellent substitute for cranberries and are likewise used in preserves, jams/jellies, sauces, etc., which make delicious condiments for meat and game. The jam reportedly has a very pleasant flavor. ‘Wentworth’, ‘Andrews’, and ‘Hahs’ are three varieties that are examples of the better-tasting, American form (americanum) versus the European form (see note below). And, how does a glass of juice made with highbush cranberries sound to you? Check out this delicious-sounding recipe courtesy of EdibleWildFood.com. 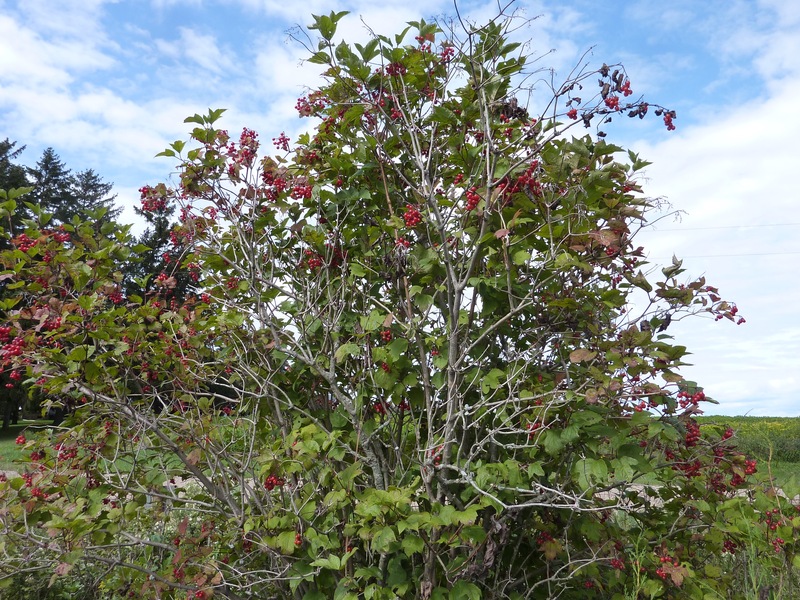 *Please Note: There is also a European form (species or possibly subspecies) of highbush cranberry (Viburnum opulus) that is described as having inedible/bitter fruit. If you wish to eat the fruit, make sure you plant the true North American species, Viburnum opulus var. americanum. 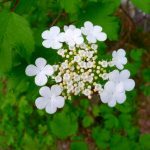 You will often see “highbush cranberry” listed for sale under its old name, Viburnum trilobum, so many people have had the unfortunate experience of discovering that what they purchased was the European form when they were hoping for the American form. It may also be worth noting that the European form (opulus) is widely naturalized in central Maine, and a trusted source has written to say that he finds that one–at least in central Maine–more often than he finds the native (americanum) form! If you are wondering whether or not there is a way to tell the difference between the two types (without the need to taste the fruit), then check out the 3rd bullet in the FAQs section below. Above Photos: Highbush cranberry shrubs in central Maine defoliated by Viburnum leaf beetle larvae. 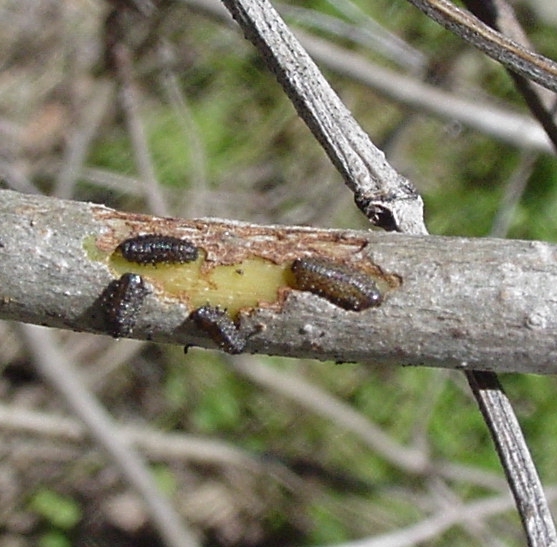 Rightmost image shows four Viburnum leaf beetle larvae feeding on one of the branches. 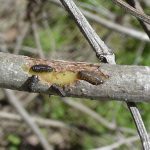 With all of the leaves already consumed, these larvae were feeding on the bark and inner branch layers! Here is a list of some very good questions we have received over the years, with answers provided from UMaine Extension Specialist in Ornamental Horticulture and Professor of Sustainable Agriculture, Dr. Lois Berg Stack (now retired and sorely missed). 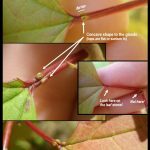 Where can I purchase highbush cranberry plants? 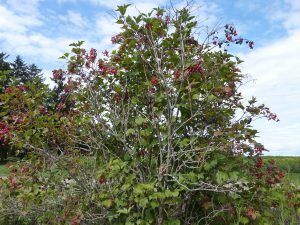 Answer: Highbush cranberry has long been a popular landscape plant, and it is widely available at local nurseries and garden centers. Look for it in displays of native plants, hedge plants, flowering shrubs and edible landscape plants. Also, since this plant is a viburnum, be sure to look in the viburnum collection. If Highbush Cranberry is a cross-pollinating plant, does it need two or more separate plants planted together (same species or not) to produce fruit? Answer: No. Viburnums tend to be self-fruitful. That is, an individual plant’s flowers can pollinate each other, and there is no need for a second type (or even a second individual plant) to provide pollen. And, if you are planting native plants, every one is genetically different from another. In terms of cross-pollination, planting two individual native plants would be the same as planting two hybrids/cultivars. 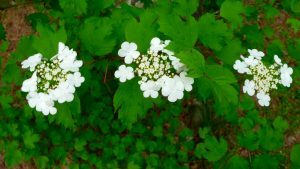 Most of the highbush cranberry viburnums sold in the landscape industry are selections from the wild, or hybrid cultivars that have been developed. These types are valued for their larger fruits, brighter-colored fruits, bolder fall color, dwarf form, etc. 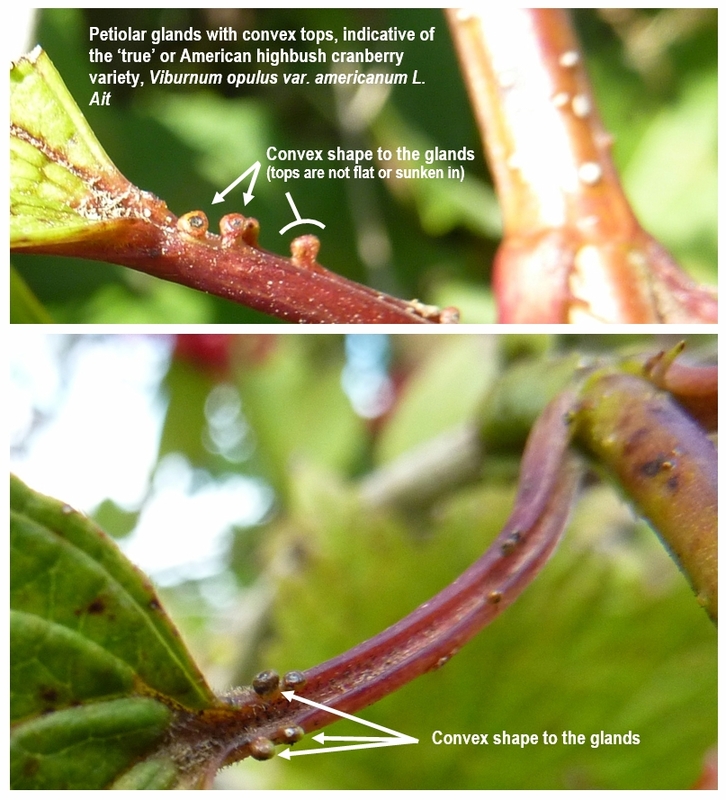 How does one tell the difference between the true, Americanum highbush cranberry form (Viburnum opulus var. americanum) and the poor-tasting and invasive European form, when there is no fruit to taste-test or compare? Do native highbush cranberry plants constitute a unique cultivar? If I plant a cultivar from a nursery, would that risk altering the genetics of the native shrub(s)? Wentworth seems to have good fruit and fall color but I hesitate to ‘dilute’ native genotypes. Answer: Native plants are not cultivars. A cultivar is a plant that has been hybridized; ‘cultivar’ is short for ‘cultivated variety.’ Plants found in native stands are simply called native plants. Your question about “diluting” native stands by planting hybrids is a good one. But, Pandora’s box has already been opened. Your few plants would have very little impact on the native viburnums around you, compared to the hundreds or thousands that other people have planted for many years. ‘Wentworth’ highbush cranberry viburnum is a very nice selection. Although it is referred to as a ‘cultivar’ or ‘hybrid’ in the landscape industry, it is a selection; it was selected from wild plants in New Hampshire. Thus, all of the ‘Wentworth’ plants in the world are identical, and are a clone of that original one that was dug from the wild. Even a planting of just ‘Wentworth’ plants would pollinate, and produce fruits. 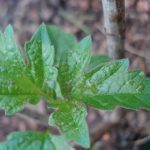 Can I prune my highbush cranberry? 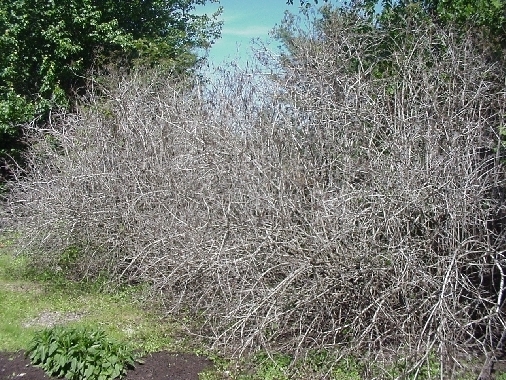 I need to move my highbush cranberry. How (and when) should I do that? Answer: There can be challenges to doing this, such as: 1) If the plants are large ( it’s harder to move large shrubs than small ones); 2) The root systems expand outwards; roots often reach 2-3 times as wide as the branches; and 3) The roots are often intermingled with the roots of other nearby plants, so digging would damage the other plants. But, if you really must move one, follow these steps: First, determine the size of root ball you’d be physically able to move. The wider the better … but remember that soil is heavy. Without seeing the plant to be moved, I’d suggest a root ball two feet across, and 10-12″ deep. Second, in the spring, before bud break, go out and draw a circle on the soil to outline the size of the rootball you will eventually dig. Move 2-3 inches inward from that circle, and draw a new smaller circle. Along that inner circle, use a spade or sharp shovel to create a ‘dotted line’ of insertions … place the spade on the circle, insert it to its full depth and remove it without taking any soil out. Then move one spade-width around the circle and repeat, all the way around the circle. What you will have done is sever half the roots, but you’ll have left half the roots untouched. During the summer, the uncut roots will sustain the plant while the cut roots will generate new young roots. Water well during dry weather to encourage new growth of roots. Finally, in the fall (or following spring), go back to the shrubs. This time, use the spade to cut a continuous line into the soil, along the line of the larger circle. Then undercut the soil ball, and move the plant. Your root ball will contain lots of new young roots that were generated at the tips of the cut roots, and that will help the shrub establish in its new location. Do you have additional questions? See also Cornell University’s “Highbush Cranberries” fact sheet and/or the NRCS/USDA’s Highbush Cranberry Plant Guide, or contact Charles Armstrong, UMaine Extension’s Cranberry Professional, at the address or phone number below. 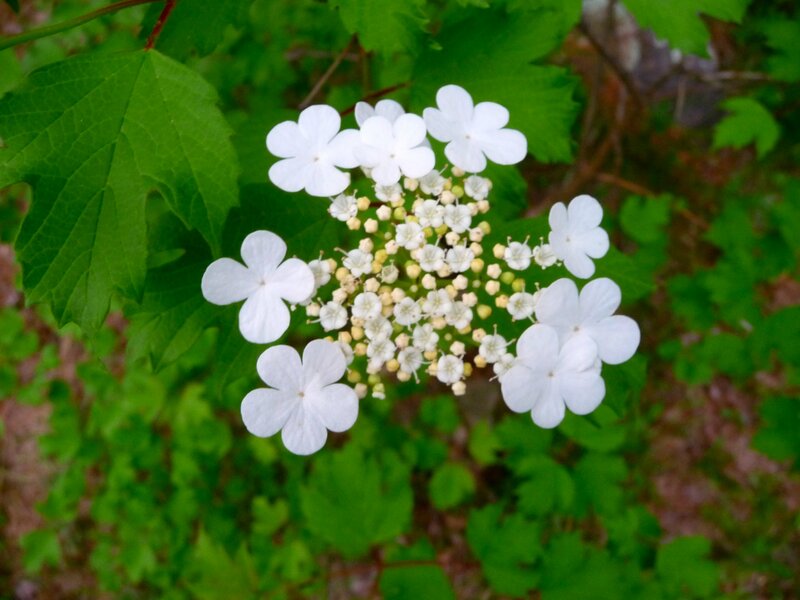 Photos by Charles Armstrong, except: Viburnum opulus var. americanum photos by Joe Frisk — used with permission (and gratitude).